Pin gear drive unit consists of a pin gear and engaging pin rack (or pin wheel). 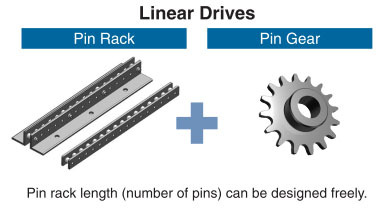 ・All pins used in the pin rack and pin wheel are hollow pins, allowing you to easily install the unit using the holes. ・By jointing the racks, the pitch distance can be maintained and the unit can be connected, enabling long distance linear drives. 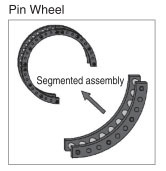 ・Pin wheels for large machines are assembled in segments, so large diameter pin wheels are available by combining the segments. The pin gear has specially-shaped teeth to continuously and smoothly engage rollers. The tooth portion is hardened for additional strength and wear strength. 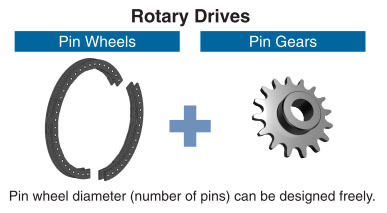 You can select the pin gear drive unit specifications from between the standard series (steel type) and S series (stainless steel type) according to your operating environments. * The above amount of backlash in mm is a calculated value and not a guaranteed value. Also note that the backlash amount varies due to wear of the pin gear drive unit and the pin gear. Using hollow pins, the holes can be used to fix the side face to another device with bolts. On installation, you can decide the position by setting up a stopper or guide on the convex face. The angle-style straight line rack can be fixed to another device by using the tightening bolt holes for fastening. Use the link buttons below for detail information regarding pin wheel, pin rack and pin gear.